Last year we had a fantastic anniversary celebration in my Anna's house. This time I was totally busy with my office work and we did not even find time to go out and do some shopping for the special day. But we somehow made time to have dinner at outside. Thamizhini was not knowing why we are going for temple, and why do we have food outside. She should have thought that yet another day at Restaurant. :P Thamizhini was eagerly waiting to go out and have food. These days she nicely asks us to go to Hotel for dinner. Lovely smile from my daughter! I was just asking Balaji to take us to somewhere where we have not been. 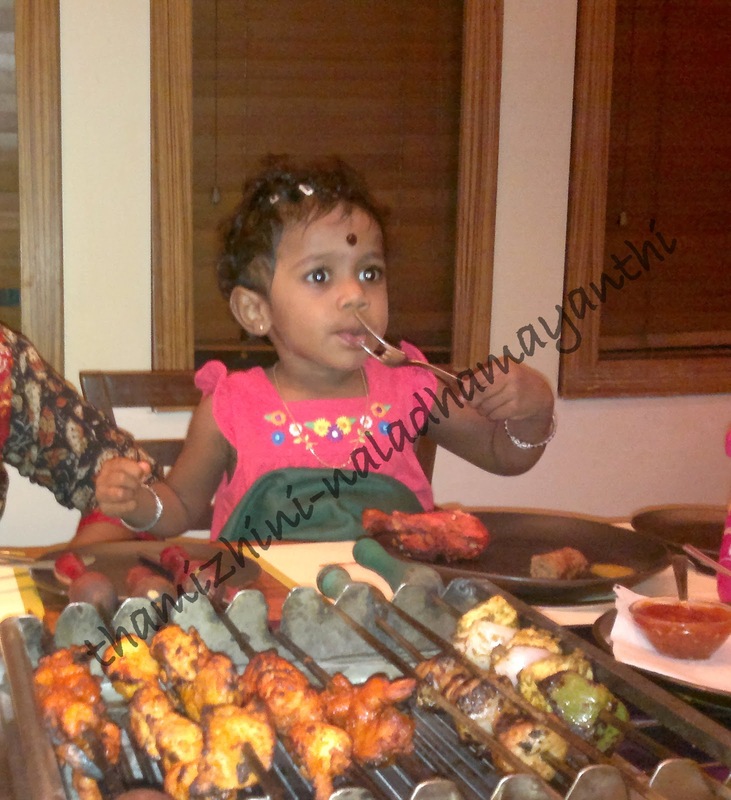 And finally we deiced to go to Barbeque Nation at T Nagar for Dinner. As it was on weekday, we could easily get table for 4. 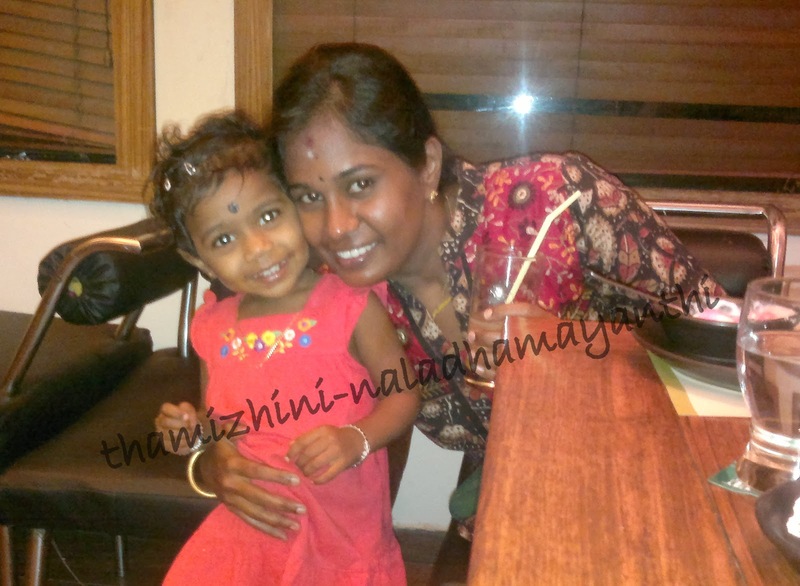 I was not very sure how Thamizhini likes food at BBQ nation, so I fed her an Apple while we were waiting for the table. 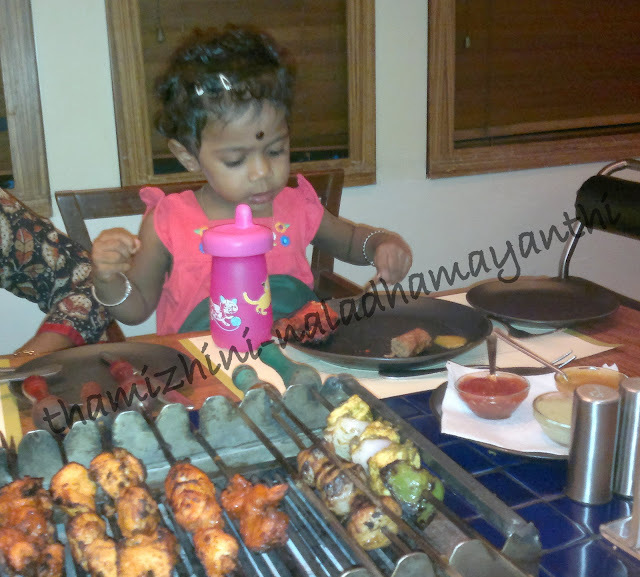 So Thamizhini was quite happy as she was not much hungry there. Once we got in, Thamizhini selected her chair and sat on it. The waiter helped her to have napkin in place and she was happy to have the napkin with her. And we all got busy in eating. Yeah, Thamizhini too! 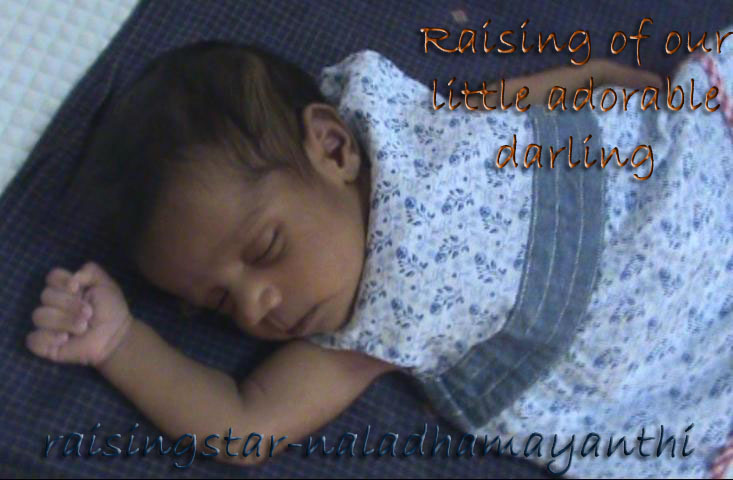 She was asking me like, "Amma athu venum.... Amma chicka, Amma fish....!" Hmm.. She did not like to taste any veg items there :P Amma pola :D"
The one interesting thing which I want share here is her eating manners. Even we astonished by seeing her table manners, My God, she does everything as Pro. Takes spoon full of sauce puts her on the corner of her plate and keeps the spoon back, ask us what she wanted and have cup in her hand and eats cleanly! This is how I eat. I'm grown up now. Check out the below one. 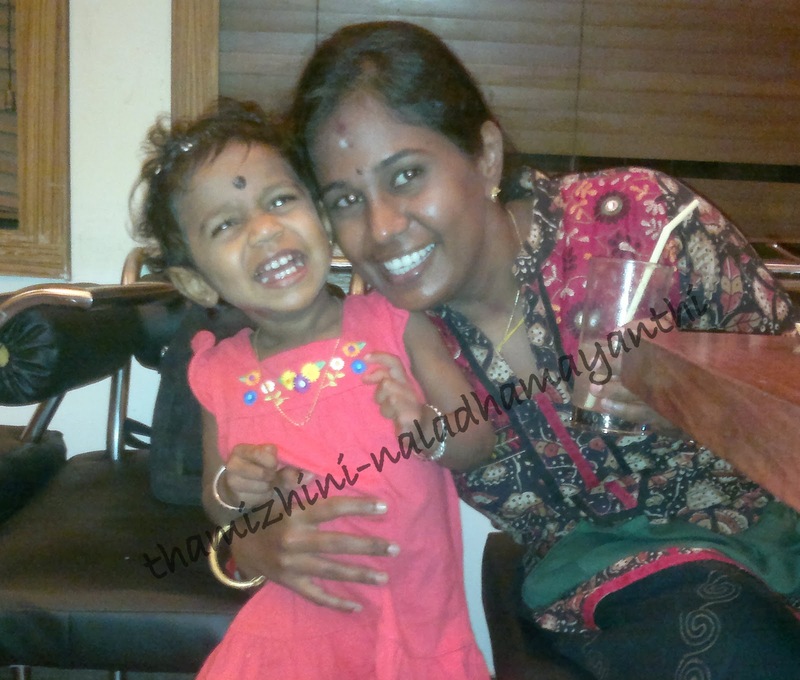 Clicked on the same day at home when Thamizhini was having lunch. Compare with the above one. Oh! Amma, you added this photo here. Anyhow, those who see this photo: This is how I eat at home. Check out the video.. We loved those moments. We never thought that she would be neat this much in dinner table. Sushmetha Vivek: Akka very nice. Trained Thamizhni very well. All credit goes to u.
Dhamayanthi Karuppanan: Oh! No... Training ah.... Not at all! These days kids are not innocent. They know how to behave out of their home.